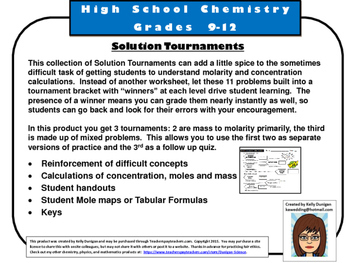 This trio of Solution Tournaments can add a little spice to the sometimes difficult task of getting students to understand molarity and concentration calculations. 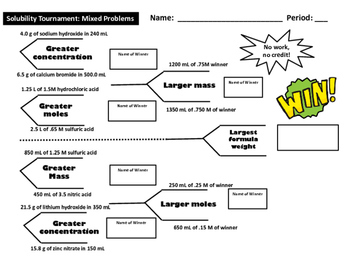 Instead of another worksheet, let these 11 problems built into a tournament bracket with “winners” at each level drive student learning. The presence of a winner means you can grade them nearly instantly as well, so students can go back and look for their errors with your encouragement. 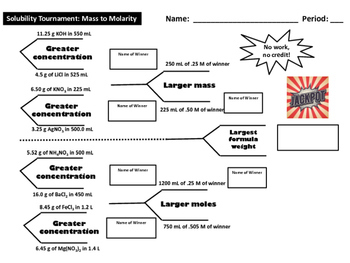 In this product you get 3 tournaments: 2 are mass to molarity primarily, the third is made up of mixed problems. This allows you to use the first two as separate versions of practice and the 3rd as a follow up quiz.